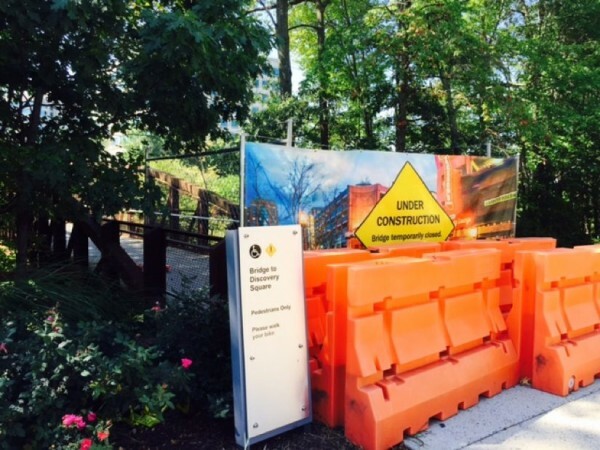 The pedestrian bridge that links Reston Town Center’s Bluemont Way and the Discovery Square office buildings off Sunset Hills Road has been closed for several weeks and will likely be closed into the fall, representatives for Boston Properties said. Pete Otteni, Boston Properties Vice President of Development, said the bridge, which takes pedestrians over the W&OD trail, suffered damage that needs to be repaired. Boston Properties, which owns most of the buildings at Reston Town Center, also owns the bridge and the Discovery Square buildings. “We discovered some damage to the bridge this summer that required repairs, and we believe that the damage was caused by ice-melting products used during the winters since the bridge was installed,” Otteni said in an email.